acrylic on canvas, 36" x 26" 2016.
watercolor on cut paper, 10" x 10," 2016.
acrylic on canvas, 24" x 22," 2016.
watercolor on cut paper, 8" x 10," 2016.
acrylic on canvas, 24" x 24," 2016. Statestreet, Jacksonville, Second Avenue, Whole Foods Parking Lot; each 24" x 36," acrylic on cut Tyvek, 2015.
acrylic on cut canvas, 22" x 30," 2015. Grate, acrylic on canvas, 20" x 24," 2014. Acrylic on layered Tyvek, 42" x 60," 2015.
acrylic on cut canvas, 2015.
acrylic on layered and hand-woven Tyvek, 26.5" x 29," 2015.
acrylic on canvas, 49" x 56," 2015. Jon & Motoko, 7" x 8," acrylic on birch panel, 2014. Husky (Pliers), 22" x 24," acrylic on canvas, 2014. Baby Quilt with Square, acrylic on canvas, 49" x 49," 2014. Purple Arrow, acrylic on canvas, 20" x 24," 2014.
acrylic on birch panel, 5" x 12," 2013. Origami Paper, acrylic on birch panel, 7" x 8," 2014. Serial Rust, Roll-Up Door, acrylic on canvas, 20" x 24," 2014. Quilt, acrylic on canvas, 14" x 16," 2013. Star, acrylic on shaped birch panel, 48" diameter, 2013. 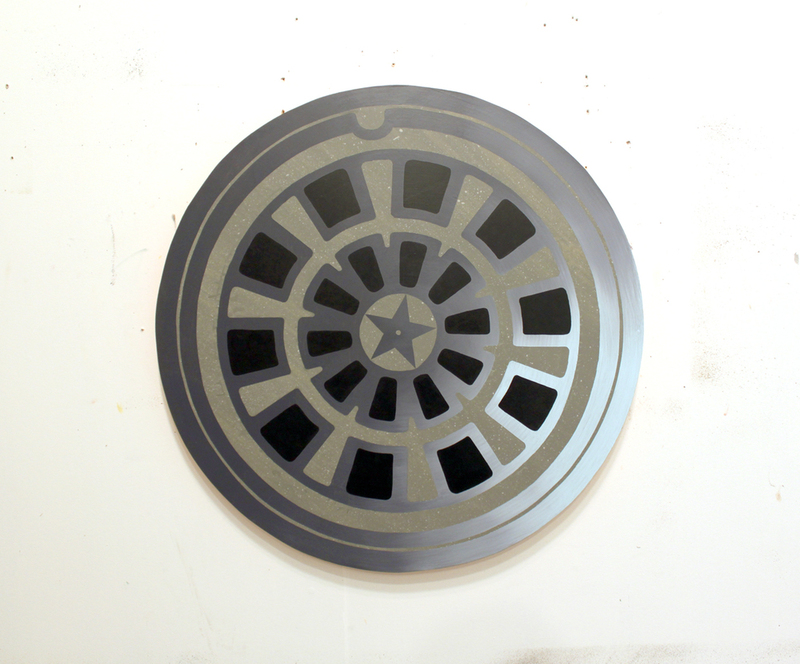 Star (side view), acrylic on shaped birch panel, 48" diameter, 2013.
acrylic on shaped birch panel, 10" diameter, 2013. 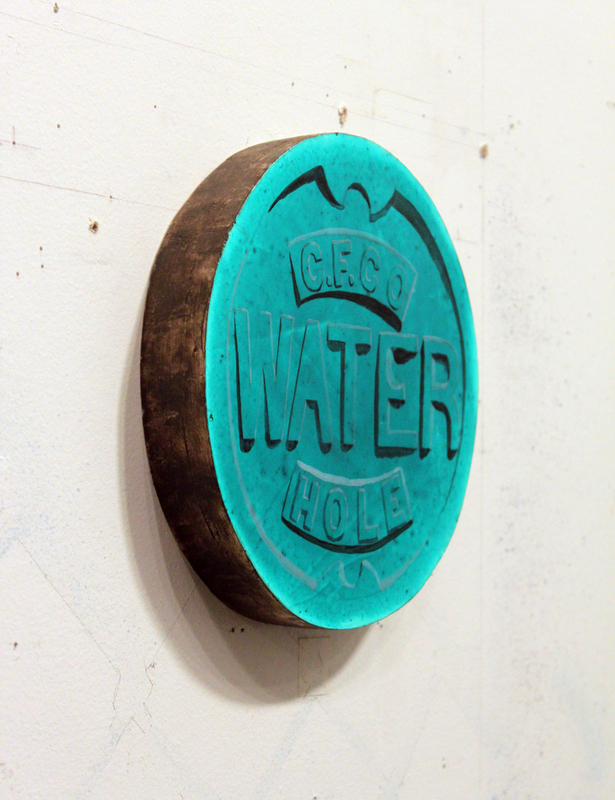 Water (side view), 10" diameter, acrylic on shaped birch panel, 2013.
acrylic on canvas, 8" x 8," 2013.
acrylic on shaped birch panel, 10" diameter, 2015. Child's Drawing with Red Block, acrylic and crayon on birch panel, 10" x 8," 2013.
Letters, acrylic on birch panel, 12" x 19," 2013. "My practice is one part meditation, one part Yankee work ethic." Hannah is a painter living in Asheville. She studied at Yale University and Boston University, and has exhibited internationally. She is represented by Slag Gallery in New York and the Tracey Morgan Gallery in Asheville. She is a columnist for the art blog Hyperallergic. Her work was shown recently at The Drawing Center in New York and is currently on view at the Turchin Center for Visual Art in Boone, NC.